Speedy action and swift speech shatter the assault of non-Buddhists as well as of heavenly devils. A master of surpassing caliber, transcending even the principle of his own school, condescends to help a student of excellent aspiration and of the sharpest wisdom. What if you meet a fellow who never turns his head even if he gets hit with a stick? Luopu came to Jiashan and without bowing stood facing him. Jiashan said, "A chicken dwells in the phoenix nest. It's not of the same class. Go away." Luopu said, "I have come from far away, hearing much about you. Please, Master, I beg you to guide me." Jiashan said, "Before my eyes there is no you, and here there is no old monk." Jiashan said, "Stop it, stop it. Don't be so careless and hasty. Clouds and the moon are the same; valleys and mountains are different from each other. It is not difficult to cut off the tongues of the people under heaven. But how can you make a tongueless person speak?" With this, Luopu started to obey Jiashan. could utterly and independently change its form. Independent through and through, he knows how to turn around. he was subtly led by the nose to realize mind. Pulling his nose around subtly conveyed the spirit. Illuminating night outside the blinds, the moon appears as if at noon. Before the cliff of a withered tree, wildflowers are always in spring. In front of the cliff of dead trees, flowers and plants are always in spring. Tongueless man, tongueless man -- an intimate phrase fully reveals the right decree. Walking solitary in one's fiefdom, all is clear. May all under heaven be happy and joyful. Luopu had been studying with Linji. At length, he left Linji, and went to Mt. Jiashan where he built a hut for himself near Jiashan's monastery. When Jiashan learned of Luopu's presence, Jiashan wrote Luopu a letter and gave it to an attendant to deliver. When the attendant presented the letter to Luopu, he took it and, without reading it, extended his hand to the monk as if asking for something else. When the monk didn't say anything, Luopu hit him and told to go back to his master. 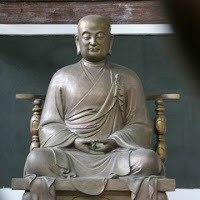 When the monk told Jiashan about this, Jiashan said, "If he opens the letter, he'll be here in three days If he doesn't open the leter, nobody can save him." Three days later, Luopu appeared -- and that's where the case begins. 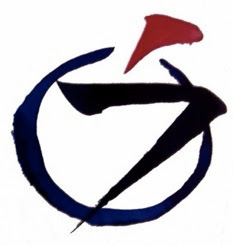 This koan is about the confusion of awakening, for awakening has confused Luopu. Jiashan says to him, "It's not that you can't cut everything off, but how can you give life? As a Zen student, you can summon peace and tranquility on your cushion, but how are you going to deal with the myriad difficulties that arise in life, the things that you've suppressed in your zazen? Sure you can kill your pain by cutting it all off with your zazen, but how are you going to use that pain to give life to your life, a life that's free and unfettered. If you acknowledge the parts of yourself that you don't like, it opens you up. Every time we expose something negative within ourselves, we'll contribute not only to unifying ourselves but also to the universal process of wholeness -- with ourselves and all sentient beings, and all insentient beings as well. the mountains and rivers extending a single hand. for the one with ears to hear? "Preach the Gospel at all times. When necessary use words." At least, he never said it using words. Perhaps he walked it, tongueless. Perhaps, when he spoke, he spoke the same way.